Almond butter is one of the most beloved foods in the U.S. and abroad. It's widely used in homemade cake, cookies, pudding, protein shakes, smoothies and energy bars. Manufacturers claim that it's an excellent source of vitamin E, magnesium, potassium and monounsaturated fats. The health benefits of almonds are backed up by science, so it's no surprise that nutritionists recommend this treat. This delicious treat is chock-full of calcium, phosphorus, magnesium, niacin, riboflavin and folate. It also boasts large doses of vitamin E and omega-3 fats. Peanut butter, by comparison, delivers 94 calories, 3.8 grams of protein, 3.4 grams of carbs, 7.9 grams of fat, 1.1 grams of fiber and significant amounts of calcium, magnesium, potassium, zinc, vitamin E and B vitamins. It's not easy to choose a winner in the almond butter vs. peanut butter debate. Almond butter, though, is lower in saturated fats and higher in fiber and unsaturated fat. Additionally, it contains less sugar and higher amounts of calcium, potassium, magnesium and other minerals. Both products vary in quality and nutritional value depending on the brand, so make sure you check the labels. When consumed as part of a balanced diet, almond butter can benefit a person of any age. First of all, it's made from almonds, so it boasts significant doses of healthy fats, protein, slow-digesting carbs and fiber. According to a 2018 review published in the journal Nutrients, these nuts not only lower bad cholesterol but also maintain good cholesterol levels and protect against cardiovascular problems. Heart disease sufferers who added 10 grams of almonds to their daily meals experienced a major reduction in triglyceride levels in as little as six weeks. Almonds are good for your brain too. A 2016 study featured in the journal Brain Research Bulletin found that rats fed with almonds had a better memory and lower rates of cognitive dysfunction and neurodegenerative diseases. These crunchy nuts are particularly beneficial for the elderly, keeping their brains sharp and protecting against age-related disorders like Alzheimer’s and dementia. If you have diabetes, consider swapping your go-to snacks for almond butter. A 2017 study published in Metabolic Syndrome and Related Disorders found that these nuts improve glycemic control and blood lipids in just six months. Researchers attribute these findings to the high amounts of protein, fiber, vitamin E, potassium and healthy fats in almonds. Check almond nutrition facts and you'll see that these nuts are not exactly low in calories and fat. Yet snacking on almonds could help you get leaner and keep the pounds off. A 2015 clinical trial featured in the Journal of the American Heart Association indicates that substituting high-carb snacks for almonds may reduce abdominal fat and cholesterol levels. Subjects who made these changes to their diet lost significant weight — especially in the abdominal region — within six weeks. Due to its high protein content, almond butter suppresses the appetite and helps preserve lean mass while you're on a diet. Enjoy this treat in the morning to fully reap its benefits. Research shows that a high-protein breakfast may increase satiety and trigger positive changes in appetite hormones, making weight loss easier. Almond butter is also an excellent source of fiber and polyunsaturated fats (PUFAs). Both nutrients aid in weight management and appetite control by reducing hunger and filling you up quickly. PUFAs suppress appetite and increase satiety to a greater extent than saturated and monounsaturated fats. Research suggests that eating foods rich in PUFAs on a daily basis may positively alter the hormones that influence appetite. Read more: Will Eating Nuts Make You Lose Belly Fat? Need one more reason to include almond butter in your diet? According to a 2018 clinical trial published in the journal Nutrients, almonds promote gut health by increasing the number of good bacteria in the gastrointestinal tract. These healthy treats boost butyrate production, which may help improve gut barrier function and glycemic control while reducing gut inflammation. The fiber and prebiotics in almonds feed gut bacteria, leading to a healthier microbiota. Furthermore, both raw and roasted almonds contain prebiotic compounds. This means that no matter what type of almond butter you choose, you'll reap the benefits. Just make sure you avoid those with high sugar content and additives. You've probably heard it said that _beauty starts from the inside out_, and it's true that what you eat impacts how you look and feel. If your diet is largely based on junk food and sugary treats, your skin will suffer. Small changes, such as replacing your favorite cookies or chips with nuts, can make a huge difference. A quarter cup of almonds provides 40 percent of the daily recommended intake of vitamin E. Almond butter is even more concentrated and delivers more nutrients per serving compared to the same amount of raw nuts. Vitamin E, one of its key compounds, benefits your skin in several ways. This fat-soluble vitamin protects your skin from free radicals and UV radiation, scavenges oxidative stress and promotes wound healing. It may also help relieve the symptoms of psoriasis, atopic dermatitis, yellow nail syndrome and other common skin disorders. When it comes to incorporating almond butter into your diet, your creativity is the only limit. Add this creamy ingredient to protein shakes and smoothies, spread it on waffles, pancakes or toast, mix it with Greek yogurt or use it in your favorite sauces and toppings. Try simple recipes like almond butter cookies, energy balls, oatmeal cups with almond butter, homemade chocolate bars, brownies and ice cream, to name a few. Mix almond butter, raw cocoa powder, oats, stevia and flaxseeds to prepare delicious, healthy no-bake energy bars. Or add it to brownies, sugar-free cookies, high-protein packages and low-carb chocolate cake for extra flavor and nutrition. Another option is to use crunchy almond butter in dressings, sauces, dips, soups and other homemade meals. It will enhance the taste and protein content. Plus, you'll feel full quickly and avoid overeating without even realizing it. The almond butter available in stores isn't always healthy. Some varieties pack a lot of sugar, hydrogenated fats, preservatives and synthetic flavors. Organic brands are a good choice, but they come with a high price tag. 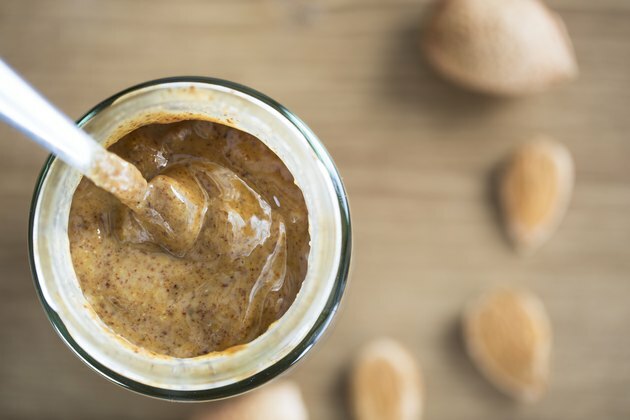 Consider making almond butter at home to save money and have full control over the ingredients used. Start with a basic recipe that requires just a few ingredients. All you need is a little bit of honey, a pinch of salt and dry-roasted unsalted almonds. Mix everything in a blender, transfer the butter to an airtight plastic container and store it in the fridge. Feel free to add dark chocolate chips, coconut flakes, protein powder, walnuts, sunflower seeds and other goodies.